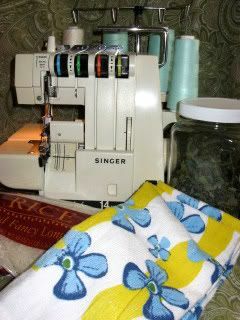 It was the perfect project to try out this sweet little addition to my sewing room – a free to me serger! My mother didn’t want it anymore and just gave it to me. (Then I threaded it and understood why.) Still, I'm not one to look a free serger in the mouth so thanks mom! Filler: buckwheat hulls, flax seed, cherry pits, wheat hulls, or rice (not quick cook rice) all work well. I used rice as my filler and dried mint from my garden because both are pantry items and time was of the essence, Husband was in pain. 1. Fold the cloth/towel/placemat in half. Pin three sides of the cloth/towel/placemat together. 2. Sew/serge three sides of the cloth/towel/placemat together. I used the serger. I bought the kitchen towels on super duper clearance. Woo-hoo!. 3. Take out the pins and turn the bag right side out. 4. Use the funnel to pour your filler into ¼ the bag, toss in some dried herbs if you like, and pin the cloth bag closed. 5. Sew the bag closed to make a chamber. I jumped over to the sewing machine to do this because I couldn’t figure out to do it on serger without teaching Blitzkrieg all sorts of new and interesting words. Remember to remove the pins as you sew, you're less likely to break the needle by sewing over pins that way. 6. Use the funnel to pour your filler into the next ¼ section of the bag, toss in some dried herbs if you like, pin the cloth bag closed, and sew as you did in Step 4 and Step 5. 7. Before sewing the last chamber at the end of the towel, tuck the ends of the towel inside the bag, pin closed. Finish by sewing the seam shut. Remember to remove the pins as you sew, trust me on this one. 8. Heat your homemade heating pad in the microwave oven for one minute. Take it out of the microwave, put it on those achy muscles, and say ahhhh! Homemade herbal heating pads make excellent gifts too! I've been meaning to do this for a while, just need to pick the herbs. Thanks for sharing the step-by-step procedure, i can easily do it without any problem. Mrs. Micah - I used white rice because it's cheap. I save brown rice for eating :) It doesn't matter if you use brown or white rice as long as you use long cooking rice. Do not use Minute Rice.